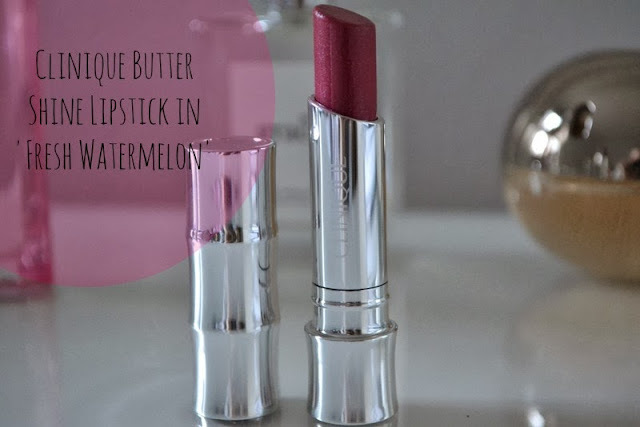 Recently I was going through all of my lipsticks and realised that I don't have many high shine lipsticks as I normally stick to matte formulas or formulas with a slight sheen. So I made it my duty to ensure that I changed this so there's another new lipstick that's made its way into my collection and I think this one is staying. The Clinique Butter Shine lipstick is creamy, smooth and delivers great colour, basically, it ticks all the boxes. I love this shade 'Fresh Watermelon' as it is a bright pinky-red watermelon colour that is absolutely gorgeous. One of my New Years resolutions is to wear more colour both on my face and in my wardrobe (pretty much all of my clothes are monochrome) so this lipstick is one of my first steps towards brighter colours. What I like is that as it's so glossy it doesn't make the colour too overwhelming and leaves a much softer finish than a matte lipstick. I would say that this lipstick is like a cross between a lipstick and a lip gloss but without the horrible stickiness of a gloss. I was actually surprised at how pigmented this lipstick is, the shine/gloss lipsticks I have used in the past always seem to lack in terms of pigmentation but this one has really got a great balance of high pigmentation and a glossy, sheen finish. Just a little side note this lipstick doesn't taste amazing, not that you're going to eat it or anything, although sometimes I feel like eating my MAC lipsticks as they smell so good ha. What I'm trying to say is if you lick your lips quite a bit you probably will have a slight issue as the taste is just icky. Love this colour, so shiny!